Micromeritics' Grant Selection Committee has selected the recipient of its grant award for the third quarter of 2010. 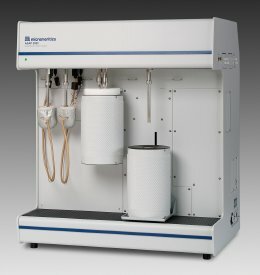 An ASAP 2050 Xtended Pressure Sorption Analyzer has been awarded to the Department of Civil and Environmental Engineering at the University of Michigan, Ann Arbor, MI. According to Dr. Christian Lastoskie, Principal Investigator, " The high-pressure (up to 10 atmospheres), research-grade isotherms that can be produced using the ASAP 2050 will be important for studies of carbon dioxide adsorption on novel metal-organic framework adsorbent materials under investigation for CO 2 separation from pre-combustion and post-combustion gas mixtures at elevated temperatures and pressures. Additionally, pore size distribution and surface area characterization of novel single-walled nanoporous carbons, tin oxide sensor particles, and cathode-active materials used in lithium ion batteries will be obtained from low-pressure isotherms of nitrogen and noble gases measured at cryogenic temperatures. " Professor Lastoskie is an expert on the subjects of molecular simulation, adsorption, and nanoporous materials. His laboratory investigates novel materials for energy and environmental applications, including metal-organic frameworks for carbon dioxide capture from combustion gases. Micromeritics' Instrument Grant Program is intended to provide particle characterization instruments to non-profit universities and research organizations for the purpose of fostering and supporting meritorious research projects. A maximum of one instrument/integrated system will be awarded per calendar quarter. The next grant decision will be made prior to 12/31/10. The next application deadline is also 12/31/10 for a 03/31/11 grant decision.